The Dogs and Storm finished 1-2 in the regular season and now they've booked a Grand Final date with each other on the last Sunday in September. www.wdnicolson.com will have various blogs throughout the week taking in the Grand Final leadup. Grand Final Show: Wed September 26! Today have the official squads for the decider... and sadly the Dogs have given us next to no sub-plot by naming the same 17 that beat the Bunnies and the Storm have given us at least a little bit of interest surrounding the wing position and potentially the final makeup of the bench. 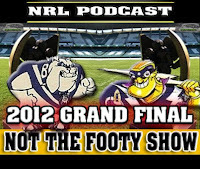 NOT The Footy Show will have Luke Patten on our Grand Final Show this week and our entire panel's choices for the 2012 Premiership will be on Wednesday's Grand Final Episode 128 on iTunes. So here is www.wdnicolson.com's low down on the Grand Final Teams on Tuesday. Into GF after beating Manly 16-10 and South Sydney 32-8. Same 17 that beat the Bunnies plus Dene Halatau as 18th man for Canterbury. All players reportedly in good nick and raring to go. Payne in biggest danger of missing out to accommodate Halatau. Storm bring Sisa Waqa back from a knee injury for Mahe Fonua and add Rory Kostjasyn, Siosaia Vave and Anthony Quinn to an extended bench. Sika Manu and Ryan Hinchcliffe are named to start despite being replaced in the starting lineup by Kevin Proctor and Todd Lowrie in the Preliminary Final. Verdict 25/09: Right now, I've leant back towards the Bulldogs just a little (but that makes it even money right now) because of the doubt over Waqa and the Dogs are a very settled lineup. For this week I'm be tapping into the betting mind of a maestro only known as 'Rainman' and he has the Storm favourites as well. WOULD YOU HAVE MADE ANY CHANGES?